Earlier, Lexus has developed a real hoverboard which runs on a magnetic levitation. However, we don’t have the streets that can actually make magnetic levitation possible in the near future. A graduate engineering student in Japan has come up with another solution. He calls it the WalkCar. While the product is not yet ready for mainstream distribution, the prototype is really turning some heads. A Japanese inventor has developed the "world's smallest electric car" – an aluminium board with wheels that carries a passenger like a Segway and fits into a backpack. Kuniaki Sato's company Cocoa Motors is set to launch the new personal transportation device this autumn. The lightweight aluminium board is approximately the size of a laptop and can carry loads of up to 120 kilograms. 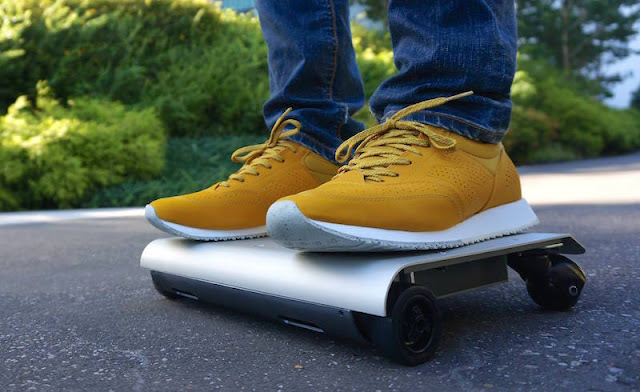 Available as an indoor and outdoor version, the four-wheeled WalkCar is powered by a lithium battery and can reach speeds up to 10 kilometres (6.2 miles) per hour. "WalkCar is the world's smallest electric car that can be mobile and put in a bag," said Cocoa Motors. "Just turn the body in the direction you want to go, you can move freely." The portable transporter is about the size of a standard laptop—which it could probably fit in most of the bags people carry today—and is made of aluminum, weighing no more than three kilograms (about 6 pounds) depending on the indoor or outdoor version. Stepping onto the board starts it automatically and disembarking immediately stops the motion. According to Cocoa Motors, three hours of charging provides enough power for travelling distances of up to 12 kilometres (7.4 miles).